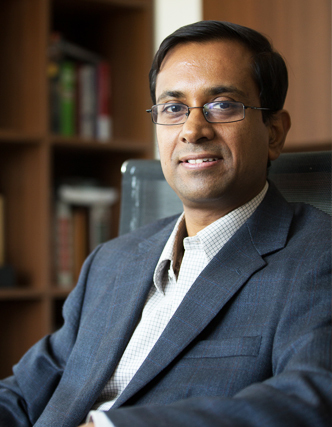 Rajesh Chakrabarti, Assistant Professor of Finance at the ISB, chronicles the global financial crisis and its impact on India. “The current mood in financial markets is markedly upbeat, with a general perception that the worst is over, at least for India. Only time can tell whether this optimism is justified,” he says. The year 2007-08 was, in spite of inflationary concerns, a good year for the Indian economy. Clocking a growth rate of nine percent for the third year in a row, with rising FDI and foreign portfolio investment, a robust corporate performance and rising cross-border M&A activity, India had finally arrived at the international scene and was, next to China, the biggest growth story in the world. However, months before the fiscal year ended, storm-clouds had already begun to gather in the global skies setting the stage for one of history’s biggest financial crises to rock the international economy. Years of global macroeconomic imbalance in the form of massive current account disparities among countries in the world (with the US and many others running several hundred billion dollar annual deficits, and China and a few other economies running corresponding surpluses) had stretched the international financial system to its limits. The deluge of investments back to the US and other developed countries, mostly in government securities, from the emerging giants, had depressed interest rates to rock-bottom levels. At the same time, most central banks in developed countries had not moved enough to counter this surge of liquidity. The financial sector, functioning on wafer-thin margins, and pushed along eagerly by bonus-fixated executives, resorted to financial engineering at a record scale, particularly in the credit market. Credit and mortgage derivatives, the bulk of which were illiquid, were not being traded in open exchanges, and therefore not open to reliable pricing, soared in popularity. Much of this was built on the idea of ever-increasing property prices in the US and elsewhere, a market that witnessed a colossal bubble. When the bubble deflated, it took with it financial giants, investment banks and insurance companies alike, storied landmarks of the financial industry landscape. It is difficult to date the crisis precisely. A recent volume from the Stern School dates the down slide story from as early as March 2007, when HSBC Holdings announced higher than expected delinquency in one of its portfolios of sub-prime mortgages. Over much of 2008, the Indian market was closely following the US markets and it was clear that the global factor had become the most important driver in the Indian equities market. That may well have been among the early signs, but clearly the world markets would not comprehend the force of the coming disaster for several more months. The run on the British bank Northern Rock and its bailout by the exchequer made headlines in September 2007 and several major banks reported significant write-downs the following month. Bear Sterns fell in March 2008 and things had begun to look seriously grim. Nevertheless, the full magnitude of the crisis was perhaps not apparent till Lehmann Brothers went bankrupt in mid-September 2008 with Merrill Lynch getting acquired soon after. That was when the world markets hit the panic button. 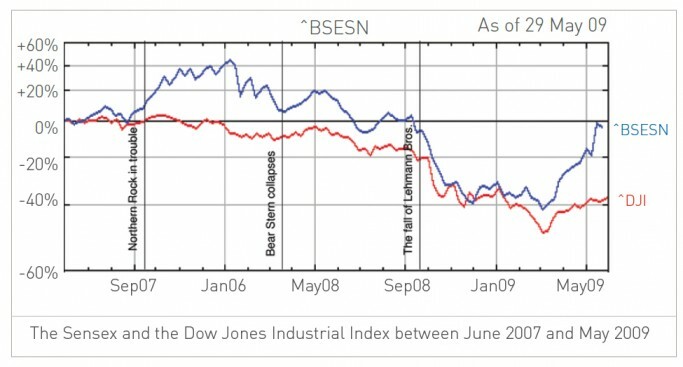 The Indian markets peaked in January 2008 (see figure 1) driven, at least in part by strong portfolio flows in response to the Fed cutting rates in late 2007. But it began to relent on global pressures since early 2008. 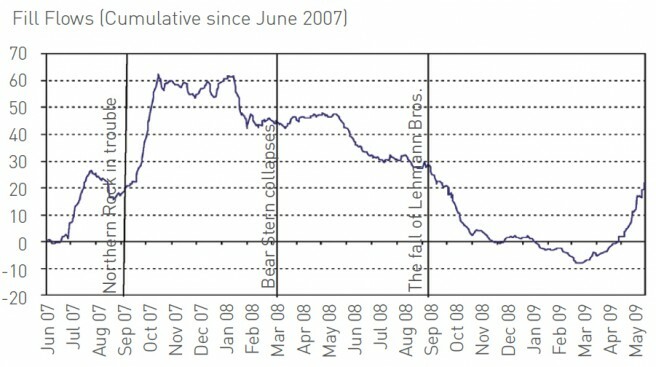 The fall was quite marked even before the Lehmann collapse. The Sensex had dropped from close to 21,000 in early January to about 13,500 by mid-September, a decline of roughly 35 percent from the peak closing value. While detecting the direction of causation between the two variables is fraught with statistical complexities, the association of the market index and the foreign institutional investment (FII) flows (figure 2) is unmistakable. FII flows, that in 2007 had reached record levels of over Rs. 76,000 crores, had begun to weaken and reverse during 2008, even prior to the Lehmann collapse. By September 15, the FIIs had withdrawn over Rs 34,000 crores from the Indian equity markets. 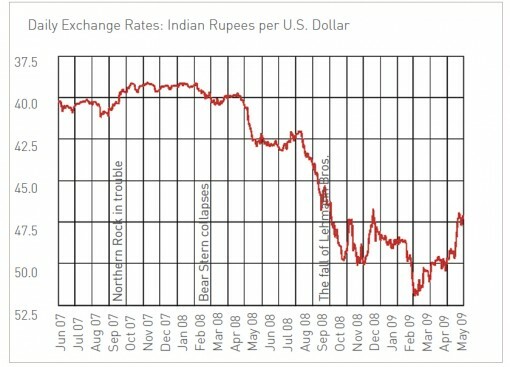 The imprint of this sustained withdrawal on the value of the Indian Rupee vis-à-vis the US Dollar is evident in figure 3. A strengthening rupee was the spectre of exporters till early 2008, with software firms lobbying hard for protection from a rising rupee (that was widely feared to appreciate to a figure as high as Rs 35 per US Dollar if the Reserve Bank of India let it float completely). Accessing External Commercial Borrowing (ECBs) and issuing Foreign Currency Convertible Bonds (FCCBs) had become common practice among major Indian companies. The situation witnessed a sea-change in the first three quarters of 2008 with the rupee dropping steadily from 39 to 46. It was against this grim background in India that Lehmann Brothers collapsed on September 15, 2008. While the global financial crisis may be a protracted episode, the fall of Lehmann Brothers is, without doubt, its “tipping point”. It created ripple effects around the globe and across markets by shaking confidence, and to a comparable extent, by creating enough counterparty risk to jeopardise the stability of scores of financial institutions and threatened even some national economies. In India itself, the direct effects were limited. 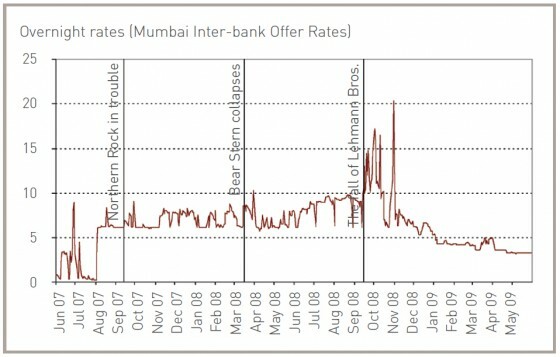 On the one hand, Reserve Bank of India regulations constrained Indian banks from dealing in complex derivative instruments that were directly affected by the Lehmann collapse and on the other, foreign banks held a small enough (less than 10 percent) share of the Indian commercial banking market. Indian banks did not have any direct sub-prime exposure. Only 14 out of 77 reporting banks had some direct exposure to Lehmann backed derivatives, that too mostly through Lehmann subsidiaries. Some mark-to-market write-downs did happen, largely because of the operations of the foreign branches of Indian banks. ICICI Bank took the biggest hit followed by SBI. Also, at 13 percent of risk-weighted assets, Indian banks had stronger capital adequacy than mandated by the Basel norms and could withstand some write-downs. Nevertheless, there were a few anxious weeks, largely because no one was quite sure about the reach and the depth of the effects of the Lehmann crash and other related and near-simultaneous disasters. The external environment was a completely different story. FIIs withdrew over Rs 14,000 crores from the Indian markets in the month following the Lehmann collapse and over half the amount in the following month. The withdrawal, of course, had little to do with weaknesses in the Indian market itself. It was a phenomenon witnessed across several emerging market economies, a response to the redemption pressures institutional investors faced in their home countries. In any case, the exchange rate crossed the Rs 50 mark and the Sensex crashed by over 35 percent to about 8,500 within weeks of the Lehmann fall. Over much of 2008, the Indian market was closely following the US markets and it was clear that the global factor had become the most important driver in the Indian equities market. Unlike China and several other Asian economies, India’s growth in recent years has not been largely export driven. Domestic investment and consumption have played bigger roles in the Indian growth story. The drought in liquidity was more serious than the stock market collapse was. The foreign borrowing window practically shut down overnight and the FIIs stampeded out of the market. Overnight rates in the Indian money market tripled to the15-20 percent range (see figure 4), creating a liquidity crisis for several mutual funds experiencing selling pressure. The other impact of the Lehmann collapse was the widespread realisation that the global recession following the financial crisis would be a deep and long-lasting one. 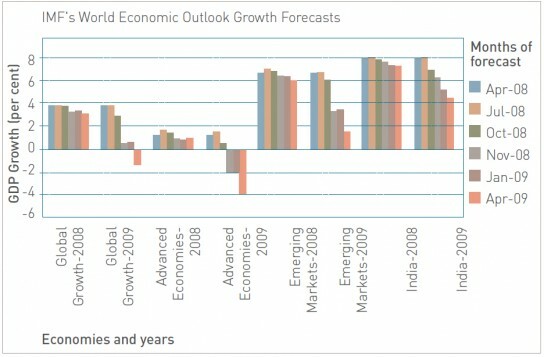 The economic prognosis the world over, already grim, worsened sharply (see figure 5). India’s outlook also worsened based on this weaker global prognosis. Unlike China and several other Asian economies, India’s growth in recent years has not been largely export driven. Domestic investment and consumption have played bigger roles in the Indian growth story. However, the expected drop in export demand was likely to lead to a deferment of domestic capital expenditure as well and the Indian economy was not as insulated from the world economy as its 20 percent export share in GDP reflected. The PM’s Council of Economic Advisors steadily scaled down the growth forecasts for 2008-09 but still kept it above the 7 percent mark. Others were less optimistic. In the wake of the Lehmann collapse it was generally held that the financial services sector, real estate, infrastructure and the export-oriented IT sectors would be the worst hit while sectors like the pharmaceuticals, media and FMCG would be largely protected. The pessimism deepened and spread across sectors with the passage of time. By January 2009, an estimate by Mckinsey put about 57 percent of the Indian economy “at risk” of the crisis – 33 percent “highly affected” and 24 percent “somewhat affected”. In the first category were the automotive, cement, chemicals, iron & steel, metals, mining and textiles from the manufacturing side and transport media, real estate and trade from the services side. It was widely feared that the hit on the textile sector, it being a major employer, would lead to considerable unemployment. The diamond-cutting industry was already feeling the deep contraction and layoffs. In macro terms the estimate was a drop of 20-35 percent in capital expenditure in the immediate run, a 4-5 percent reduction in returns to invested capital, and widespread SME failures – particularly from the textiles and auto component sectors. This last may potentially lead to a rise of 2.5-5 percent in the share of Non-Performing Assets destabilising 10-15 banks and present a recapitalisation bill for the government to the tune of 14 to 22 billion US dollars or, roughly speaking, about 2 percent of the GDP. Infrastructure would likely be a major victim of the crisis with the Eleventh plan targets of nearly half a trillion USD investment in the sector thrown completely off the tracks. Without this push in infrastructure, India’s ability to achieve a double digit growth trajectory on a sustained basis would be severely jeopardised. The actual figures justified the pessimism. Exports fell for every month since September 2008. Exports growth in 2008-09 stood at 3.4 percent, a mere shadow of its 23-31 percent annual growth rates in the previous four years. The index of industrial production (IIP) registered a negative growth of 2 percent during December 2008, with the manufacturing sector returning a negative growth of 2.5 percent. IIP growth during April-December 2008 at 3.2 percent was about one-third of the nine percent during the corresponding period of the previous year due to slowdown in all the major sectors. The decline continued through March, with the IIP actually shrinking by 2.3 percent in March, its worst performance in many years in the month. For the fiscal year 2008-09, the IIP rose by a mere 2.4 percent as opposed to 8.5 percent the previous year. Clearly the crisis was hurting the Indian economy. The government swung into action soon enough. Both monetary and fiscal measures were brought to bear both to ease the liquidity crisis in the immediate weeks following the Lehmann collapse as well as to spur the economy through the slowdown that loomed ahead. The Cash Reserve Ratio was brought down rapidly from 9 percent in September 2008 to 5 percent in early January 2009, injecting about 1.6 trillion rupees of liquidity into the system. Regulatory changes were brought in to ease foreign borrowing and to remove interest rate ceilings on NRI deposits. Simultaneously policy rates have been cut sharply and continually over the months, reducing the repo rate from 9 percent to 4.75 percent and the reverse repo rate from 6 percent to 3.25 percent. Furthermore, the operational policy rate shifted from the repo to the reverse repo rate making the effective drop in rates a whopping 575 basis points from 9 percent to 3.25 percent in a matter of slightly over six months. Between mid-September 2008 and end-April 2009, the various monetary and liquidity measures have injected an estimated 4.9 trillion rupees of liquidity, about 9 percent of GDP. The fiscal side supplemented these efforts with a few major thrusts. In December 2008 the government announced an across-the-board four percent cut in the Central Valued Added Tax (CENVAT) and earmarked an additional Rs 20,000 crore (Rs 200 billion) for infrastructure, industry and export sectors. In January 2009, the states were permitted an additional fiscal deficit amounting to 0.5 percent of the GDP, and the India Infrastructure Finance Company Limited (IIFCL) was given access to funds amounting to Rs 30,000 crore (Rs 300 billion) through tax-free bonds. The developers of integrated townships and infrastructure-dealing Non-Bank Financial Companies (NBFCs) were allowed access to external commercial borrowings and the interest rate ceiling on commercial borrowings were removed, the FII limit in corporate bonds was raised from 6 billion to 15 billion US dollars, the Duty Entitlement Pass Book (DEPB) rate was restored to pre-November rates until December 2009 and assistance was promised under the Jawaharlal Nehru National Urban Renewal Mission (JNURM) to buy buses for urban transport systems. In February, as part of the bill-on-account exercise, excise duty and service tax were cut two percentage points each. Nevertheless, the markets remained depressed till March 2009, the Sensex staying largely around the 9000 level, notwithstanding an abortive rally that touched the 10,000 mark in late December 2008. According to some estimates, together these fiscal packages released over Rs. 3 trillion in the system. The fiscal deficit has naturally soared to record levels (from budget estimates of Rs. 1.3 trillion to revised estimates of Rs. 3.3 trillion), breaking all the Fiscal Responsibility and Budget Management (FRBM) targets India has been following for the past few years. International rating agencies factored in this higher fiscal deficit and downgraded India’s sovereign rating, in some cases below investment grade altogether. Things, a few of them at least, have taken a distinct turn for the better since March. In about two months, the stock markets, aided by election results signalling a stable government have gained by almost 50 percent. A rise rather too fast for comfort for some. The new-found bullishness seems to be shared with several other countries. By the end of April, two-thirds of the 42 national stock indices tracked by the Economist had recorded considerable rise. In India, the effect could be one spurred by prompt fiscal stimuli or a realisation that the pessimism was exaggerated, it is hard to tell yet. Corporate performance in 2008-09 provided a mixed picture but 40 percent of companies in the Economic Times Intelligence Group (ETIG) recorded higher revenue growth in 2008-09 than in the previous year. Economic statistics so far have been mixed as well. Exports continue to fall (by over 33 percent compared to the same month a year ago) in April while the growth in core sectors – that make up slightly over a quarter of the IIP – nearly doubled from its April 2008 figure to 4.3 percent. The more encouraging phenomenon has been the return of the FIIs that turned substantially positive in April and May. At the end of the crisis, in relative terms, China and India are poised to emerge as bigger economic and financial powers than before and emerge stronger and relatively less bruised than other countries in the world. So far, India has decidedly had the crisis easier than most other countries in the world, though it may be hasty to say all is over already. Given India’s high growth rates – second only to China’s among large economies – even a significant fall (to 6.7 percent in 2008-09 from 9 percent a year ago) left it among the top growers in the world. So at the end of the crisis, in relative terms, China and India are poised to emerge as bigger economic and financial powers than before and emerge stronger and relatively less bruised than other countries in the world. Many have credited the financial conservatism of India’s regulator for this relative immunity to a global event, though some have wondered what premium in terms of growth foregone India has paid for such insurance from external shocks. The inflationary side-effects of the doses of fiscal and monetary remedies also remain to be seen. Professor, Executive Vice Dean & Director-Executive MBA Programme at Jindal Global Business School.